The Tzumi MagicTV is a device that allows users in the USA to watch TV on an Android phone via free over the air digital ATSC signals. It receives and decodes TV on the device, then streams decoded TV to an Android phone via a WiFi connection. 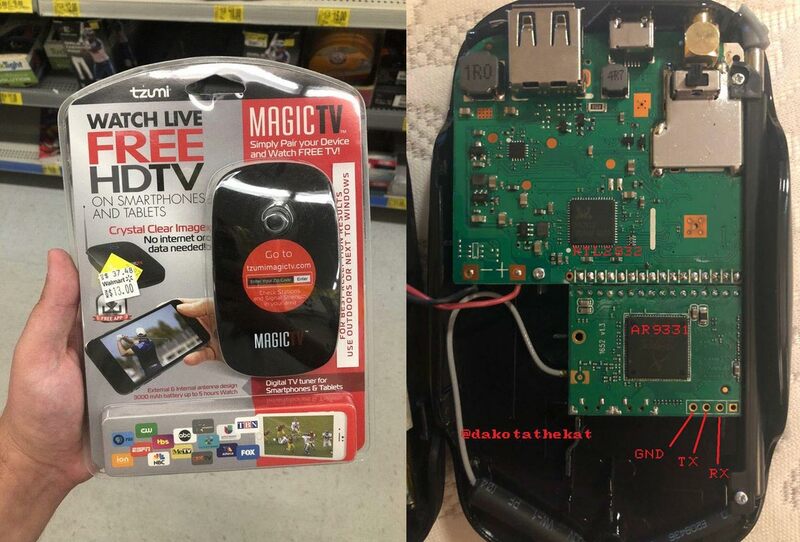 Over on Reddit user meowTheKat has alerted everyone to the fact that 'Tzumi MagicTV' devices contain not only an R828D RTL-SDR inside them, but also an AR9331 OpenWRT board and a 3000 mAh battery pack. This means that the device could potentially be used as a portable RTL-SDR server over a WiFi connection without any additional required hardware. And right now is a particularly good time for this discovery to come out, as the device is reportedly selling at a clearance sale price of only $13 at Walmarts across the USA. OpenWRT is custom open source firmware that is intended to be installed on compatible internet routers. It extends the functionality and stability of many routers. Since OpenWRT is based on Linux, it is possible to use the RTL-SDR on routers running OpenWRT and we have several previous posts about people doing this. Currently meowTheKat reports that the MagicTV is indeed running OpenWRT, and that SSH is available. The SSH password is unknown but a colleague of his is currently working on cracking the password. Once cracked it should become possible to install RTL-SDR software on to it. However, there is no word yet on if the front end has additional filtering specifically for TV signals or not. If there is additional filtering those circuits would need to be removed to restore wideband tuning to the RTL-SDR. Update: From discussion on the Reddit thread it appears that the tuner chip used is not an R828D as first thought, but instead a MXL603/608. This tuner is currently not supported in the RTL-SDR code, but support could probably be added by a developer. The tuner is connected to a demod ic, which is connected to the TS input of the rtl2832p, so code is not going to fix the fact that the device is unusable without quite a bit of tricky soldering to reroute the tuner output to the rtl. The "Tzumi MagicTv" contains an RTL-SDR, OpenWRT Board and Battery Pack. OpenWRT board + RTL-SDR + recent USB VGA hacks and we are close to a QRP SDR under $100. Maybe a project for rtl-sdr.com? I still maintain there are better options on transmit. Still, the marriage of an OpenWRT and a *quality* low noise, high linearity receiver that could be mast-mounted and battery / cleanly regulated power would be really nice. A sort of portable self-contained websdr if you will. I’m not sure MagicTV… If we (as a community) ever get the tuner driver working, will actually be a quality receiver. And the rtl 8 bit ADC is sort of getting obsolete. But I think the basic idea is one that should be explored. For $13 as the Americans say ..It’s A NO Brainer. If the tuner is a MsxLinear MxL608, the frequency range would be about 52 MHz to about 866 MHz. Per the datasheet. So no 1090 MHz or HF. However it might be possible to hardware hack direct sampling as with other RTLSDRs. This is all speculative unless/until someone adds driver support. If the chip is specifically made for tv the minimum and maximum frequency in the datasheet could just be the two limit frequencies used for television and guaranteed to work, not the real minimum and maximum frequencies. Excellent point. The official r820t2 frequency range is 42 to 1002. We all jnoe that is bunk. Comparing the two data sheets (R820T2 and MXL608) I actually see very few direct points of comparison. The noise figure and phase noise look slightly worse for the MXL608 but could be due to different measurement technique. Very difficult for me to tell if the 608 is actually a worse tuner just from the datasheet. Perhaps a smarter person than myself could look these over and give an opinion. FWIW I got two units at my local Wal-Mart and tested 1 so far. The OEM android app tunes as high as 890+ MHz, so yeah, the tuner can go out of the range that is specified for the MxL608!!! has anyone seen this on Ebay or Aliexpress or lazada? I think it will make a real fun project for SDR. Oh yes, people is already reselling it on Ebay at twice the price. From the sticker in the photo the original price seems to be $37.48, it’s just that Walmart appears to be trying to get rid of them at the moment with the $13 sale price. The eBay prices seem okay if you take that into account.